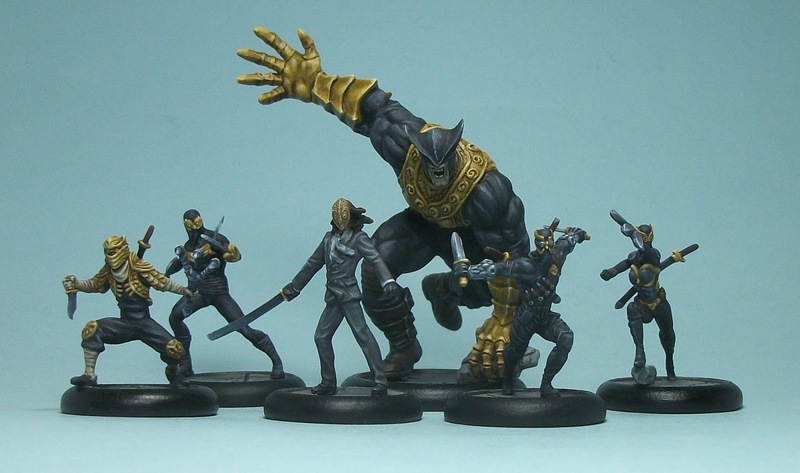 Another painted addition to my BMG collection - the High Court Member is the second Leader choice made available for the Court of Owls, and easily my preference of the two, both due to its rules versus those of Benjamin Orchard, but more especially because I think this is the considerably better sculpt of the two. The painting was done pretty quickly as I had a sudden burst of motivation. I have not yet done a really close comparison, but I suspect the sculptor re-used the Black Mask mini as a dolly basis for this sculpt - not sure how I feel about that given the premium pricing of the range. It is certainly not the only example of Knight Models doing that, and is something common in unit based gaming, but still it feels to me like a bit of a short-cut too far based on pricing for things that are in essence unique character models. 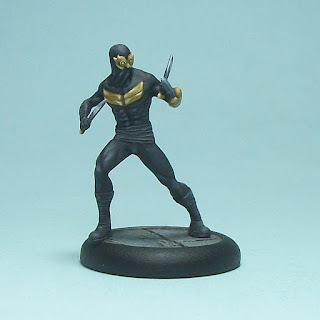 Nonetheless, it is for me easily a superior sculpt to the awkward-looking Orchard. Distract, Discourage and Demoralize Traits to impair enemies. The downsides by comparison are lower Movement, lower Willpower and lack of Veteran (which is useful for defensive purposes). I fully expect the High Court Member to get a run-out in my next game (I am facing a Bane crew for the first time that I can recall) and most likely at the upcoming tournament. This will be my first Court of Owls crew which I take to a tournament. I am looking forward to using a new crew with different qualities to my existing options (Poison Ivy, who I haven't really got to grips with; and Black Mask, who I would probably be sticking with if it had a few more affiliated Henchmen options). In terms of 'to hit' and 'damage' probabilities, the Butcher is simply not as threatening as he looks. In terms of mobility, Strix and the Butcher are pretty evenly matched, while Brandon O'Malley offers Tireless for cheap Running. Defensively Xiao Loong is hands down the best option, in close combat at least, while Strix has Acrobat (for Dodge) and Butcher has some durability with Tough Skin and Endurance 8. 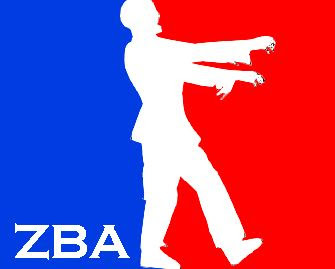 What may not be immediately apparent to opponents is that through a relative lack of Free Agents and Sidekicks, the crew gives up a relatively low VP total for KO models, but a relatively high VP total for casualties. Brandon O'Malley is my sixth Court of Owls mini (my fifth Talon), and finishing him gets me to a playable 350 Reputation crew for the Court, which is ideal as I am planning to take them to a 350 Reputation tournament in March. I started this mini a week ago, along with the James and Nathaniel O'Malley minis, in order to put the main blocks of colour down on all three, before just focusing on finishing this one - the other two will get done over the next few weeks I hope. I have to admit, I don't have much stomach for batch painting these days, so the decision was the right one as it got this done quicker than might have been the case had I persevered with all three together. That said, looking at the photograph of the back of the mini, I am not sure if I have misjudged the right hand edge of the 'gold bars' on its back; if that is the case it will be a quick fix. 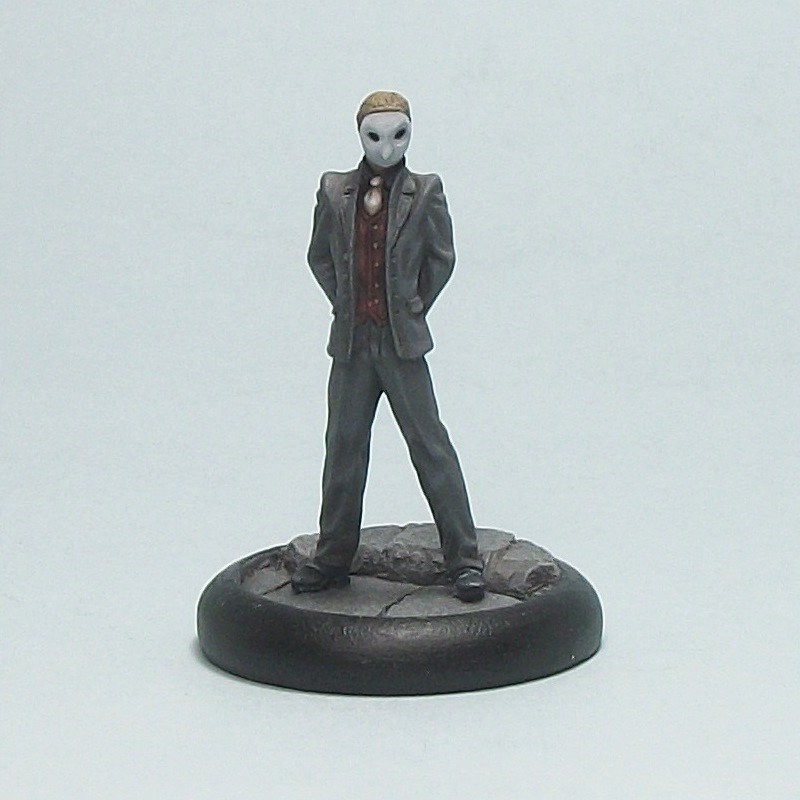 In the comics, the Brandon is the middle generation of three O'Malleys who have served the Court of Owls, and we encounter them as the hunt Calvin Rose, the most recent Talon. In the BMG Court crew, Brandon O'Malley is probably the second or third hardest-hitting character they have currently, roughly in line with William Cobb depending on the situation, but both behind Strix. I shall soon get a better sense of things as the Court are getting a run out against Brummie's Penguin crew on Tuesday! 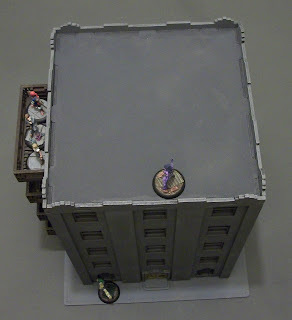 The latest addition to my contemporary urban skyline terrain options is the Lincoln Building from TTCombat and their City Scenics range. Please forgive the poor pictures! The minis used for scale reference are from Pulp City and all are mounted on 30 mm round lip bases. Like the other TTCombat kits I have acquired and built so far, I am very happy with this one. In terms of cost, it can be bought for £25.95 including postage from the TTCombat web-site or Ebay. 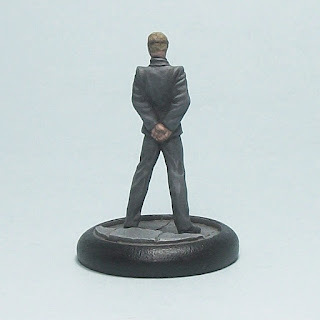 To me that is excellent value, especially given the table-top footprint of this as a scenery piece. The kit does not have interior floors or detailing, but for the kind of gaming I do that is fine since it means a quicker build, and lesser cost. 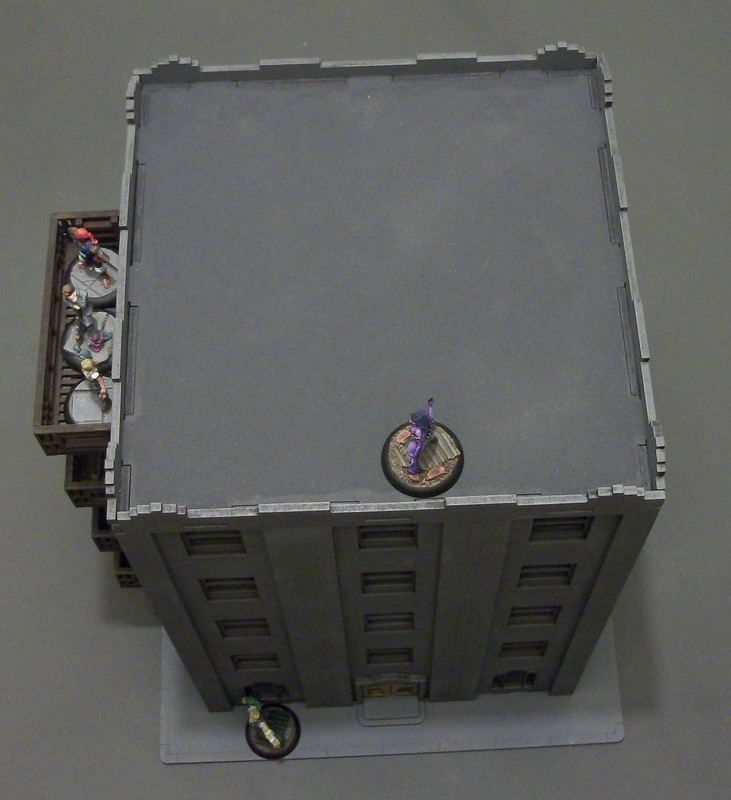 The building itself has a base with a footprint of 25 cm x 25 cm (9 3/4" x 9 3/4"); it is 30 cm tall (11 3/4") to the roof, or 31 cm (12 1/4") to the top of the parapet. 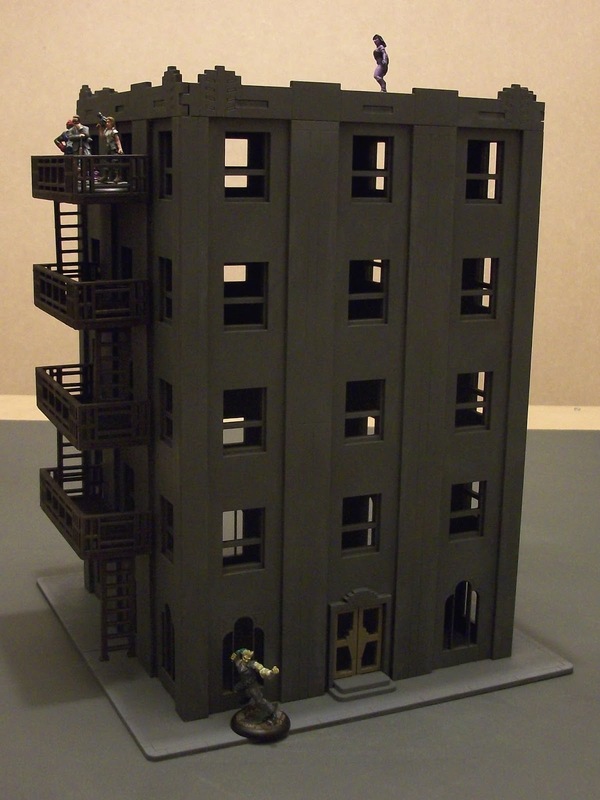 The main building, excluding the fire escape, is 19 cm (7 1/2") wide and deep. 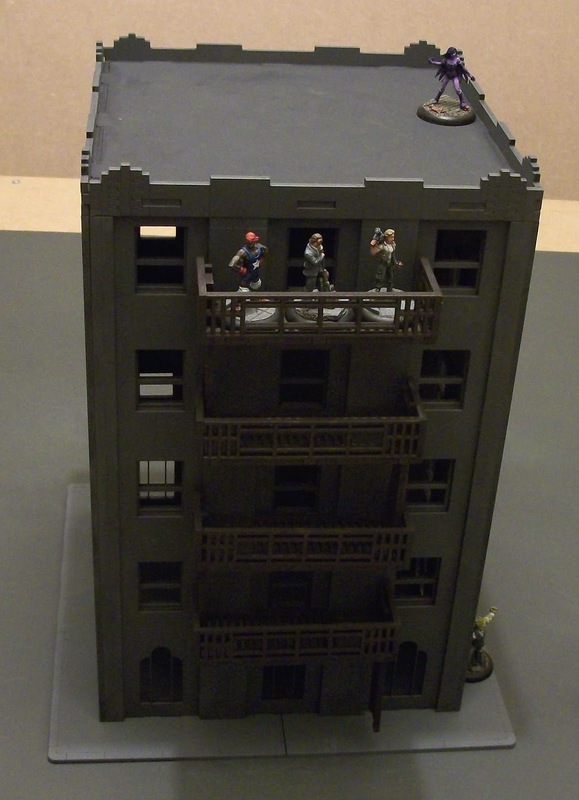 The fire escapes can accommodate 3 minis on 30 mm round bases at the same time, which is handy. The build time was around 3 hours, with the bulk of that time occupied by preparing and positioning the window frames (48 of those) and the fire escape. The instructions are not great, but overall it is a pretty straight-forward kit to put together. The laser-cutting was nice and clean, and lugs generally lined up well, although I had to sand down the connectors for the fire escape where they joined the main building. The painting was mainly done using a 4 inch paint roller while parts were still on the frames, with final touch up after assembly, except for the door, which is easiest to do before main assembly. I set up with 4 main colours and 4 rollers, meaning primary painting was around 30 minutes in two stints form the two sided of the frames. 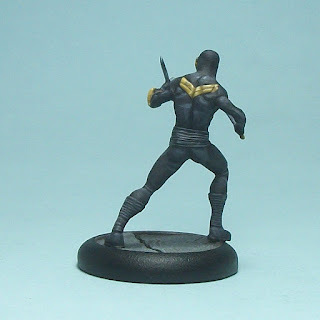 Another 45-60 minutes or so was needed for touch up painting (inside edges of parts etc.). Overall, I would thoroughly recommend this kit. 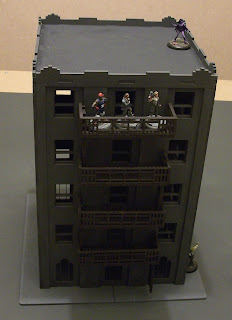 It was nice and easy to put together (although my clumsiness meant I damaged one of the fine window pieces on the ground floor), and simple enough to paint.